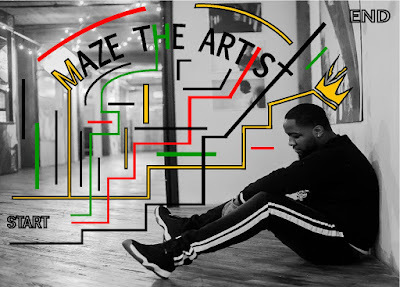 Meet Kenton Avery, an emerging artist from Chicago also known as 'Maze The Artist'. 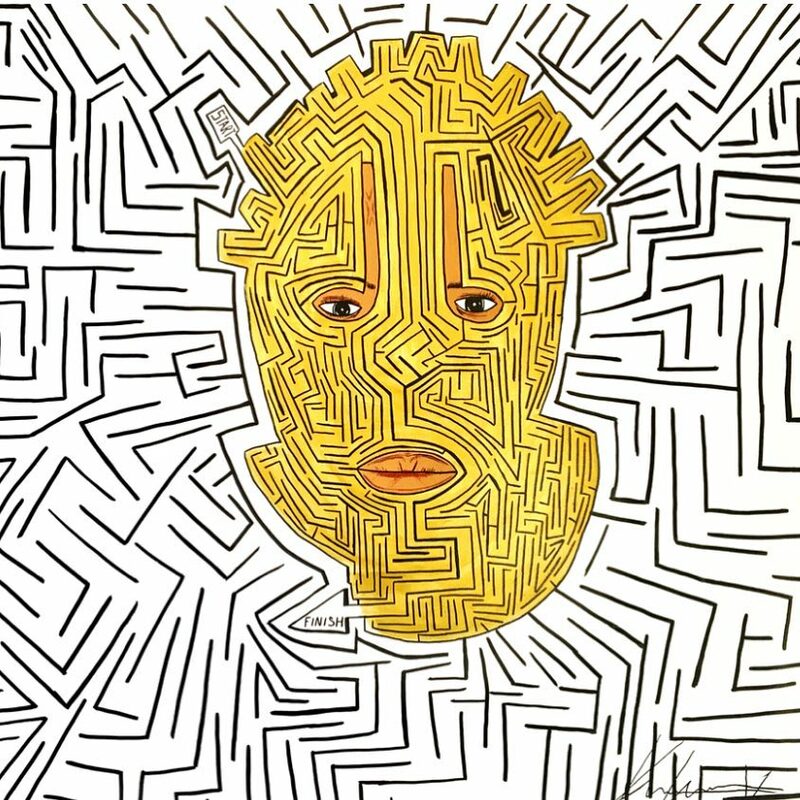 His work is very unique, many of his pieces have the viewer engaged in solving the intricate mazes embedded within his paintings. 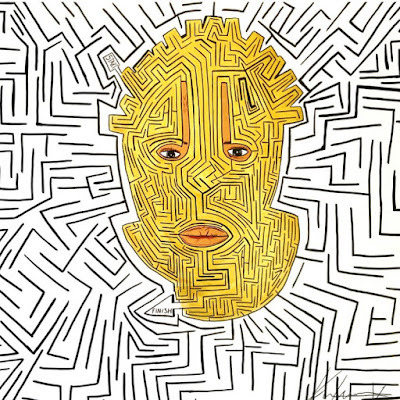 A maze is a complicated and confusing system of connected passages, which Kenton equates to life. 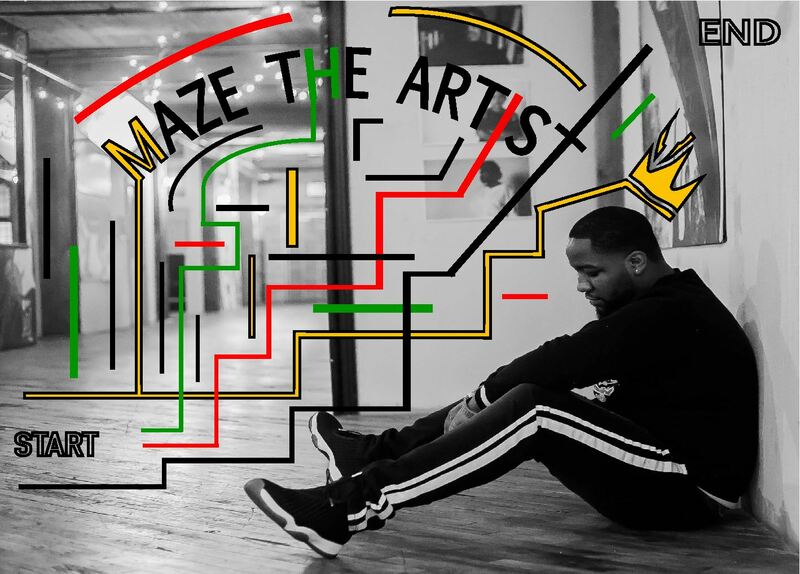 "My art depicts struggle, happiness, and power through layered painting in maze imagery. I believe that each path has a maze, and no matter how difficult, the maze can be conquered. My goal is to create work that integrates representation of different cultures and has the ability to touch everyone," explained the artist. 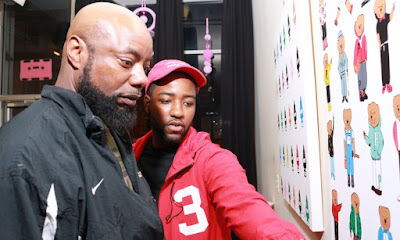 Kenton is known for his unique paintings and art merchandise, his style is influenced by pop culture, fashion, music and the iconography of the modern popular culture transmitted through mass media and aimed particularly at younger people. 'Read Between The Lines', Oil and Acrylic on Canvas, 36 x 36 Inches. Skip Hartzell's 'Its A Very Fine Day', Oil on Canvas, 48 x 60 Inches. 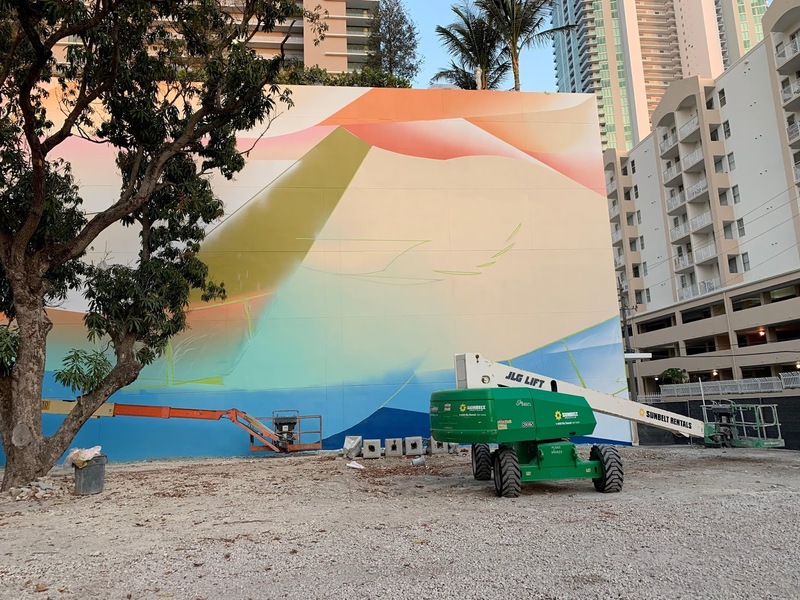 The Cultural Council of Palm Beach County debuted “The Satellite,” pop-up exhibition and event space at CityPlace in November, 2018 and it is expected to run through the Spring 2019. 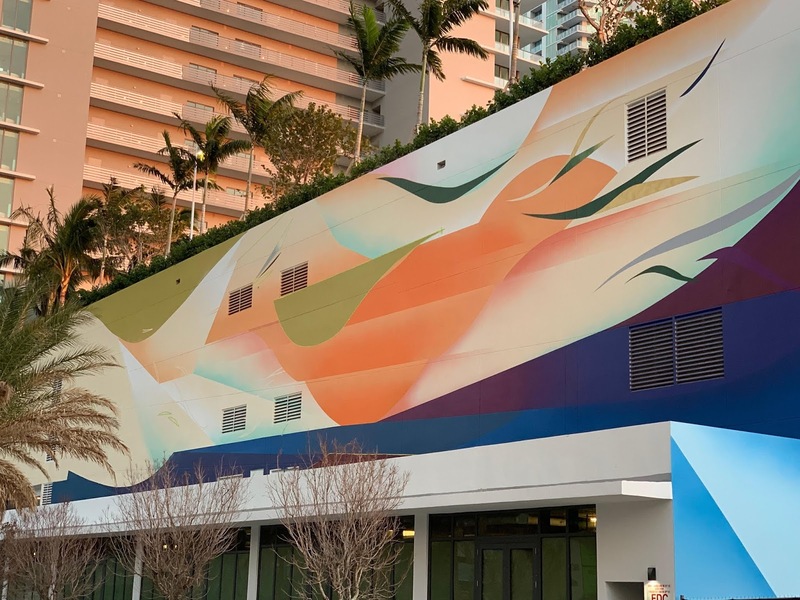 Located in the WPB Collective space across from the fountain, “The Satellite” features “Reimagine,” a special exhibition of solo artists and samplings of current and past main exhibitions from The Council’s Lake Worth headquarters. 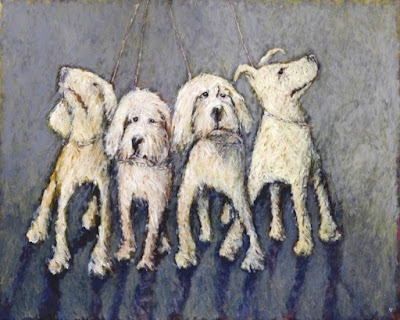 Experience Skip Hartzell's Dogs at CityPlace during the "Reimagine" exhibition along with several selected Palm Beach artists listed below. 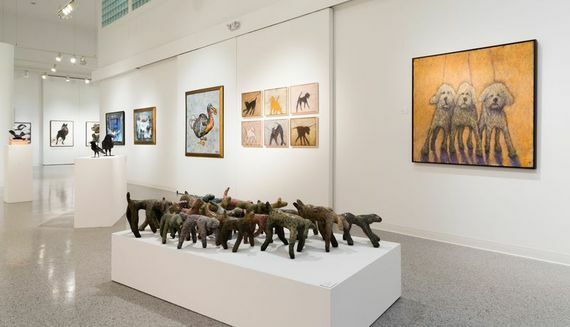 South Florida artist Skip Hartzell's passion and love of dogs in unlimited configurations are joined in his paintings, works on paper and four-legged sculptures. 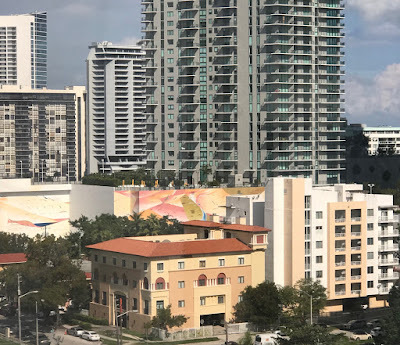 The space will also include a visitor information center, an art and design lecture series and special events and programming from local cultural organizations. 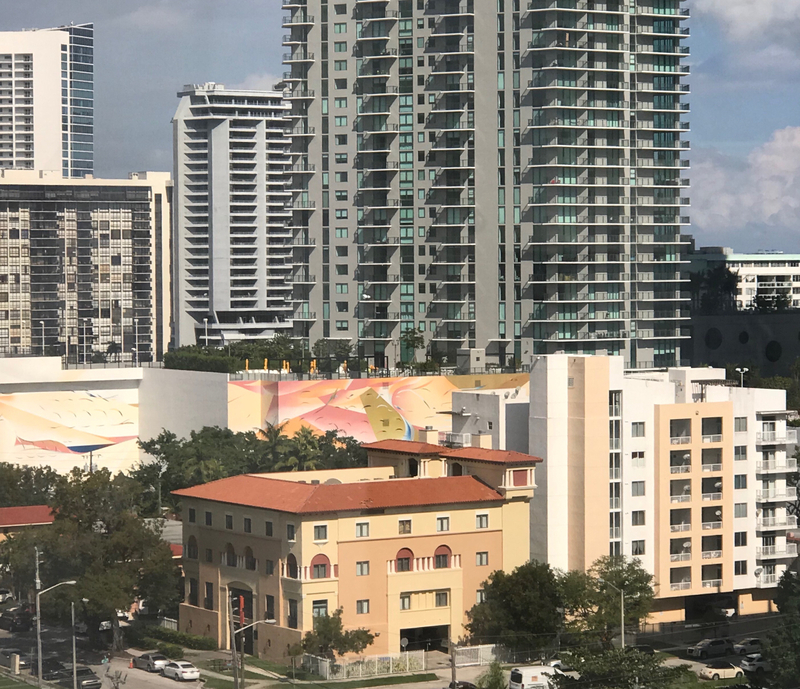 Located at 701 S. Rosemary Avenue, Suite 116, West Palm Beach, Florida (just off the main plaza). 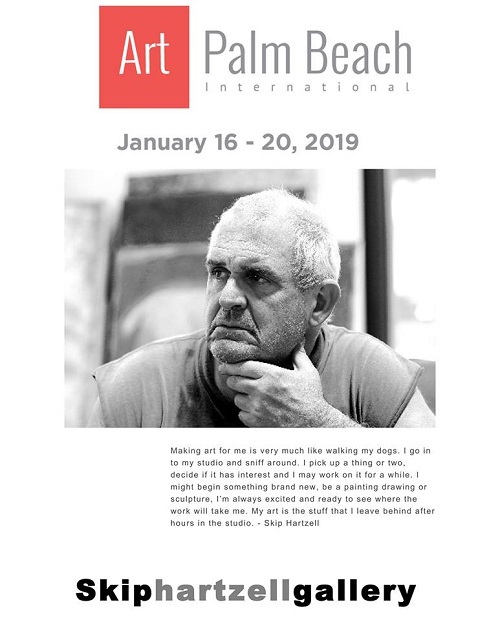 Experience "Dog Artist" Skip Hartzell at Art Palm Beach January 16-20, 2019 for a unique exhibition paying special homage to the liveliness, lovability, loyalty and natural beauty of canines. 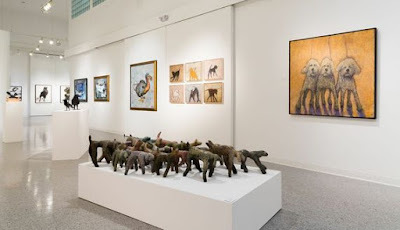 Experience Skip Hartzell's Dogs, Booth 510, a unique exhibition paying special homage to the liveliness, lovability, loyalty and natural beauty of canines. 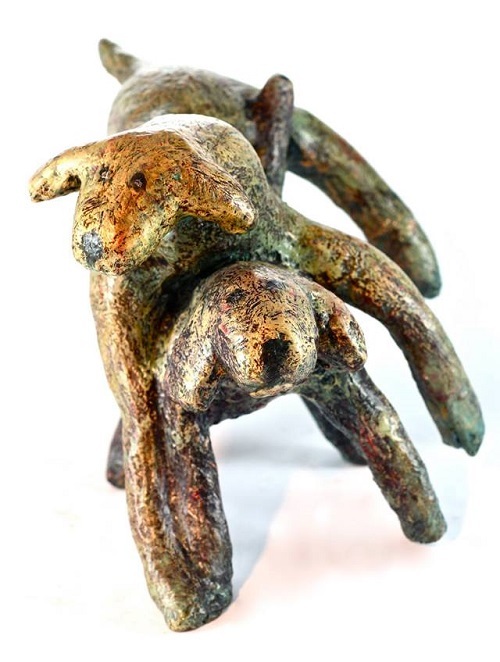 'DOG 46' - Paper, Concrete and Resin, 15" x 11"
Renowned artist Skip Hartzell creates large paintings, sculptures and drawings that capture the essence of “dog”, all of the work is rich with intricacies of color and technique. His painterly expression captures each dog’s own personality with beautiful textures, line and brush strokes using mixed media to bring each dog to life. This exciting exhibition is being curated in collaboration with Noor Blazekovic of Irreversible Projects. 'Toy Four' (2018), Oil on Canvas, 60" x 48"
Miami graffiti artist Adam Sinai is an American-Israeli multidisciplinary artist, he was born in North Miami Beach, Florida and grew up in the city of Tel Aviv, Israel. Adam is an internationally known graffiti artist, a well-established graphic designer and a motion graphics artist. 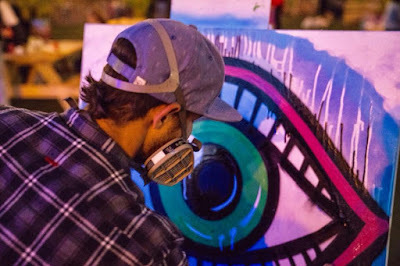 He gets his unique look on things from the art world and the urban environment. 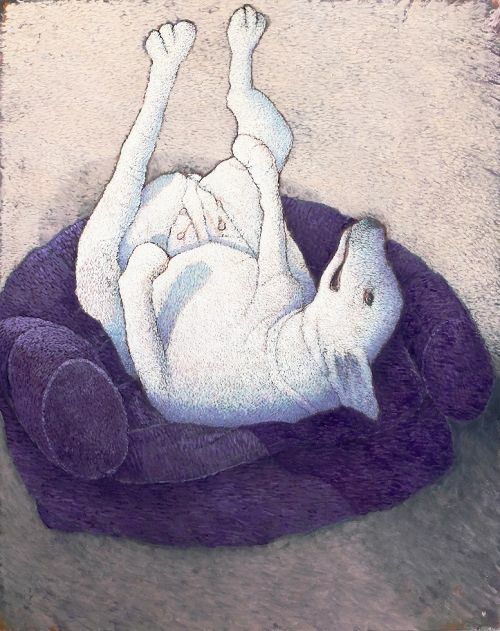 The artist holds a Bachelor of Fine Arts (BFA) and a Computer Graphics degree from Shenkar College of Engineering, Design and Art in Israel. 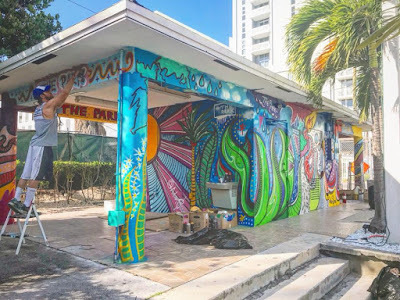 The artist is currently living and working in South Florida, his art is extremely versatile and unique, from graphic design projects, graffiti installations, paintings on canvas to large-scale murals, which he designs and creates for residential and commercial projects from start to finish. One of our favorite murals of Adam's is located in The Park at Wynwood, a local spot in the Wynwood Arts District offering cocktails, food truck eats, and live music. 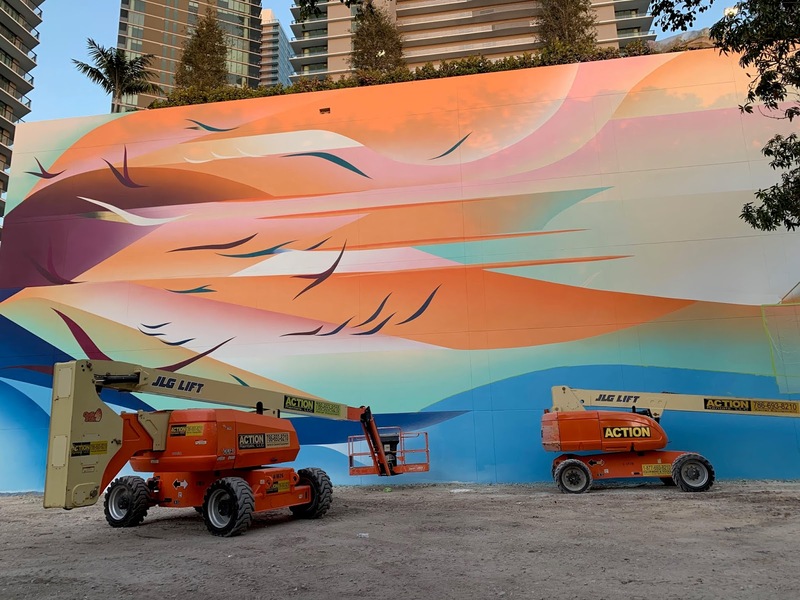 The artist aims to create a greater impression and appreciation for art and imagery, creating a public visual that allows viewers to experience a different perspective of their surroundings. And although he is able to produce a multitude of work, using a variety of styles and mediums, his true passion is graffiti and mural projects. 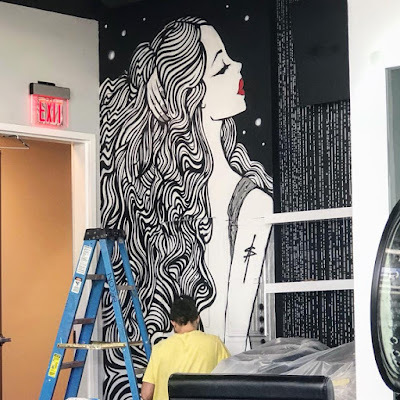 Check out his recent mural at Richy Hair Boutique in Aventura, Florida - the piece is massive from floor to ceiling, it's so striking and became the main focal point of the space. 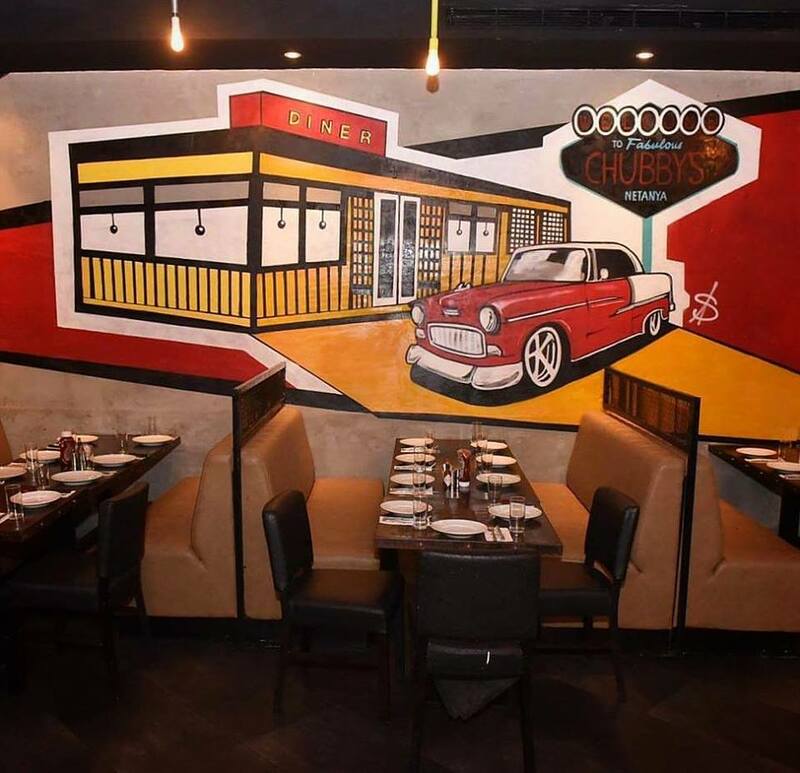 Another awesome mural pictured above is one section of multiple walls Adam painted at the famous diner Chubby's in Netanya, Israel. To inquire about a custom mural or unique art piece for your home or business, contact Adam to discuss a future project or idea. 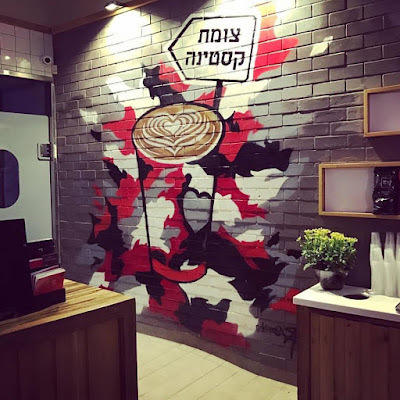 Adam Sinai is also a partner in a design company called Design Graphic Studio. The team makes their clients' visions come to life. "Our artworks and designs are showcased in a wide range of mediums. Every new project starts from a basic idea and goes through a long process in order to bring the idea to life. 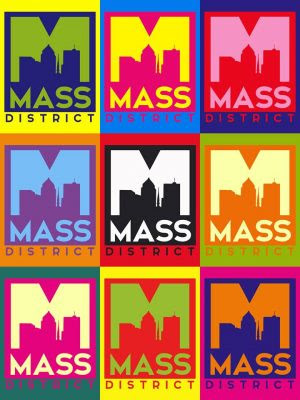 It’s very important to us to keep a good communication with the clients, and fully understand their needs and expectations," explained Adam. Submit now for your opportunity to have your art displayed on advertisement space in Florida. 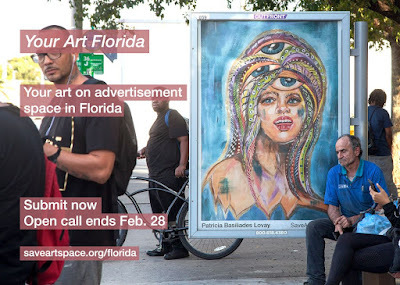 SaveArtSpace will be transforming advertising spaces into public art in Florida! 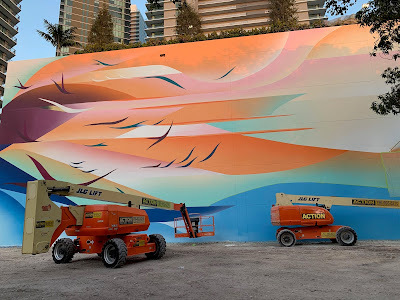 All artists (including puerto rico and US territories) are encouraged to submit. See all available open calls at saveartspace.org/submit.